This page reveals the use of electronic warfare equipment in and on the F-104C which operated at Udorn AFB Thailand in 1966 till 1967. In the second half of 1966, an effort was begun to retrofit the F­104Cs with ECM to counter the growing surface to air missile (SAM) and anti aircraft artillery (AAA) threat in Vietnam. Radar Homing and Warning (RHAW) gear was first installed in the F104Cs that were deployed to Udorn, Thailand, but by the end of 1966, most F­104Cs had been fitted with the equipment. This fit marked the first use of ECM equipment in the Starfighter. 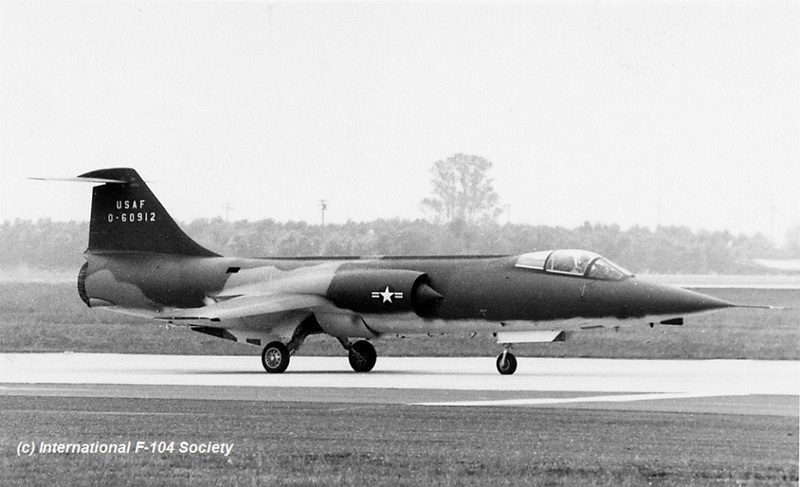 The USAF used F-104C 56-912 to test the equipment (mainly from Edwards Air Force Base). Beneath a photo of the aircraft (taken in 1967 at Edwards) showing clearty the RWR equipment mounted under the nose and aft section. The aircraft itself never was used in SEA but stayed at Edwards Air Force base until its retirement. The RHAW system on the F­104C consisted of two components: the AN/APR­25 radar warning receiver and the AN/APR­26 launch warning receiver. This system was basically identical to that fitted to the F­105s, F­4Cs and some F­100s used in Southeast Asia (SEA). The APR­25 was designed to provide 360 degree warning of S,C and X­band radar signals. It consisted of several small electronics boxes, four spiral antennae, a small panel of lights,and a three inch cathode ray tube (CRT) threat display. The most visible evidence of the APR­25 installation on the F­104C was the two antenna fairings installed on the lower fuselage just forward of the tailpipe. Lateron this was seen also on the CF­104 aircraft in Europe. The fairings are clearly seen on the photo on the right side, on both sides beneath the engine nozzle. ...... An other part of the system is the blade fairing mounted under the rear of the radome. The forward blade fairing housed two spiral antennae, each biased 45 degrees to the longitudinal axis. Each rear fairing housed one single spiral antenna biased 45 degrees away from the tailpipe. The strengths of the radar signals received by the four antennae were used to determine the direction and "approximate" range of each threat. To the pilot, the most obvious part of the installation was the threat display CRT. It was originally mounted on the windshield bow, but was later located just above the instrument panel glare shield on the right side, next to the "angle of attack gauge". When a threat radar was detected, a strobe was presented on the CRT emanating from the center, extending toward the threat's azimuth. The length of the strobe indicated the relative strength of the threat signal, and three concentric rings on the display provided a measurement gauge. Although the strobe's length could give a rough range estimate, this approximation was only accurate enough to distinguish high priority threats from low priority threats, and could not be used to establish the geographic position of the threat radar. A panel of lights was used to indicate the "type" of threat. A particular light would be illuminated for each "type" of threat radar signal detected. Although the radar emissions of the "Fan Song" SAM target tracking radar were of most concern, emissions from "Fire Can" AAA radar and various MiG radars could be detected and displayed ; notably however, emissions from long range early warning radars (EWRs) could not be detected. Illumination of a particular light was accompanied by an aural tone generated in the pilot's headphones. These tones ranged from an insistent rattlesnake‑like buzz for "Fan Song", to a repetitive chirp signifying a "Fire Can". The electronic boxes associated with the APR‑25 were mounted in the cockpit forward of the instrument panel. The first F104C installation had a box placed so as to interfere with the travel of one of the rudder pedals, but this was quickly remedied and the fix was used as the model for all following installations. AN/APR25 and 26 systems. (Photo thanks to Fred Doughty). Click on the photo for a better view. The APR‑25/26 suffered from poor discrimination and a high false‑alarm rate. A nearby flight of F‑105's running their jammers, an EB‑66 barrage jammer, even the harmonics from friendly shipborne radar could trigger a threat warning. Owners of 1st generation "Fuzzbuster" automotive radar detectors, which were constantly warning of the presence of dangerous, ticket‑wielding, electronic dooropeners, can relate to the distraction and desensitization caused by too many false alarms. Pilots reacted to the false alarm problem in a predictable manner: they turned the RHAW gear off. Tom Delashaw, a USAF Fighter Weapons School graduate who served as weapons officer for the F‑104s in SEA, and was one of the first to fly an ECM‑equipped F‑104C, was also one of the first F‑104 pilots to realize the limitations of the APR‑25/26 system. Tom related how the "beeps & buzzing" of the RHAW were annoying and most often irrelevant. The APR‑26 had a very low false alarm rate, but it was unfortunately linked to the same power switch as the APR‑25 "noisemaker", so the more capable launch warning system was also shut off. Lest you think that F‑104C pilots were irresponsible or unique because they shut off their RHAW gear, consider the fact that e‑ ven Robin Olds, who was then commanding the Udorn F‑4 Phantom wing to which the F‑104Cs were attached, had kept his RHAW gear turned off after he flew his first few missions with it in his F‑4C. The noises generated by the RHAW system were annoying and distracting, and could block out more important radio messages. SAMs had to be visually acquired by the pilot in order to avoid them, and a radio call from a wingman warning of an incoming SAM would be of much more use than another buzz over the headphones. Why was the APR‑25/26 system fitted to the F‑104C if it was not effective, you ask? 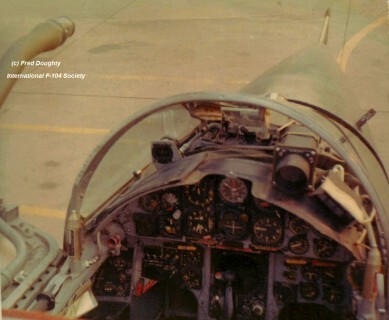 The APR‑25/26 had served admirably for the Wild Weasels, but these aircraft also had a dedicated Electronic Weapons Officer (EWO) and the SEESAM system which allowed invalid signals to be sorted from valid threats. USAF F‑4Cs also had a backseater who, trained as a pilot not an EWO, often had little more to do than listen to the RHAW and try to sort out the dangerous signals from the spurious. Single‑seat F‑105Ds had APR 25/26 too, but the RHAW was usually "shut off" before entering combat when the underwing jammers were turned on. Why then was the single‑seat F‑104C fitted with an unsuitable pice of electronic gear when money was not allocated for more vital gear??? It was pute politics. The "Powers that Be" determined that all USAF aircraft flying over North Vietnam would be fitted with RHAW gear, regardless of the limitations of the systems fitted. The Powers were not in the habit of listening to the counsel of their combat pilots as to what equipment was useful or required to prosecute the air war. On 12 January 1967, a test flight was conducted out of Korat AB, Thailand, to determine the viability of fitting a QRC‑160 (AN/ALQ‑87) self‑protection radar jamming pod to the F‑104C. The pod was mounted on the centerline hardpoint, and gun firing tests were performed during the flight to ensure that expended links would not impact the jammer. The pod was tested up to 500 KIAS, and the test was deemed a success. Tom Delashaw still has a four minute film of this test of which a shot has been used to create a picture which can be found inside this article. The effectiveness of the ALQ‑87 pod on the F‑104C is debatable. 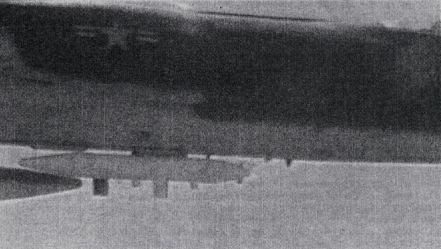 The F‑104C's small radar cross section (RCS) would make the pod more effective than one mounted on an F‑105 or F‑4, but these aircraft had long since been operating with dual pods. The ALQ‑87 didn't work well when used on a single aircraft, in any case. Multiple, pod‑equipped aircraft flying in a gaggle jamming cell, were required to effectively combat the enemy "Fan‑Songs". Whether the maneuver limitations of the jamming cells, the airspeed restrictions imposed by pod carriage, or the "extra" drag, were worth the limited protection provided by the pod on an air superiority fighter, is questionable. 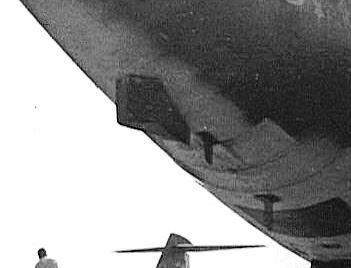 The ALQ‑87 probably would have been of some use against "FireCan" radars during low altitude airstrikes conducted by F‑104Cs during this time period. In any case, the pods were never made available. Although an excess of ALQ‑87s was available for F‑4s and F‑105s by early 1967, the Powers determined that the F‑104s would not get pods. No explanation has been found for this decision. An astute observer would notice that the F‑104Cs used by the 198TFS, Puerto Rico Air National Guard (PRANG) had their "RHAW" equipment removed. This is not surprising since the APR‑25/26 was never very effective, and was nonetheless made obsolete by the introduction of new radars like "Fan Song F" in 1968. USAF aircraft still flying in SEA had their RHAW gear updated with more capable systems, but the cost of the update was obviously deemed not worthwhile for the PRANG. Given the fact that the APR‑25/26 gear would rarely be turned on, and recognising the extra burden of maintaining and tuning the gear, one can understand the decision to remove it from the PRANG F‑104Cs. ECM equipment for tactical aircraft came of age during the war in SEA. Such was the lethality of the anti‑aircraft threat over North Vietnam that ECM gear was deemed necessary for survival in fighter aircraft. The first‑generation equipment installed in F‑104Cs had its "limitations", but it marked the realization that aircraft operating in a radarguided threat area need some form of radar warning system. Whether or not the APR‑25/26 had any impact on the fate of the F‑104Cs used in SEA is still in question, but this gear is nonetheless notable as the forerunner of the more capable RWR systems destined to be fitted to Canadian and European F‑104s in the following decades.